Bianica Pires and myself recently had a paper published in Computers, Environment and Urban Systems entitled "Modeling the Emergence of Riots: A Geosimulation Approach". As you might of guessed the paper is about riots but that is not all. In the paper we have a highly detailed cognitive model implemented through the PECS (Physical conditions, Emotional state, Cognitive capabilities, and Social status) framework based around identity theory. The purpose of the model (and paper) is to explore how the unique socioeconomic variables underlying Kibera, a slum in Nairobi, coupled with local interactions of its residents, and the spread of a rumor, may trigger a riot such as those seen in 2007. In order to explore this question from the "bottom up" we have developed a novel agent-based model that integrates social network analysis (SNA) and geographic information systems (GIS) for this purpose. In the paper we argue that this integration facilitates the modeling of dynamic social networks created through the agents’ daily interactions. The GIS is used to develop a realistic environment for agents to move and interact that includes a road network and points of interest which impact their daily lives. Below is the abstract and a summary of its highlights in order to give you a sense of what our research contribution is. In addition to this we also provide some images either from the paper itself or the from Overview, Design Concepts, and Details (ODD) protocol. Finally at the bottom of this post you can see one of the simulation runs, details of where the model can be downloaded along with the full citation. Immediately after the 2007 Kenyan election results were announced, the country erupted in protest. Riots were particularly severe in Kibera, an informal settlement located within the nations capital, Nairobi. Through the lens of geosimulation, an agent-based model is integrated with social network analysis and geographic information systems to explore how the environment and local interactions underlying Kibera, combined with an external trigger, such as a rumor, led to the emergence of riots. We ground our model on empirical data of Kibera’s geospatial landscape, heterogeneous population, and daily activities of its residents. In order to effectively construct a model of riots, however, we must have an understanding of human behavior, especially that related to an individual’s need for identity and the role rumors play on a person’s decision to riot. 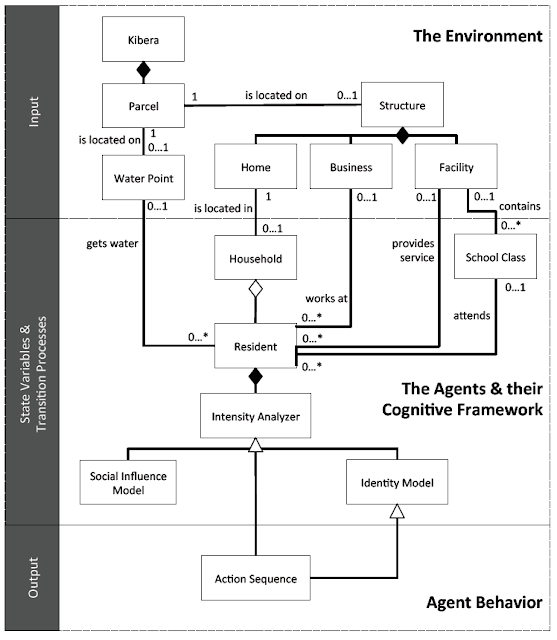 This provided the foundation to develop the agents’ cognitive model, which created a feedback system between the agents’ activities in physical space and interactions in social space. Results showed that youth are more susceptible to rioting. Systematically increasing education and employment opportunities, however, did not have simple linear effects on rioting, or even on quality of life with respect to income and activities. The situation is more complex. 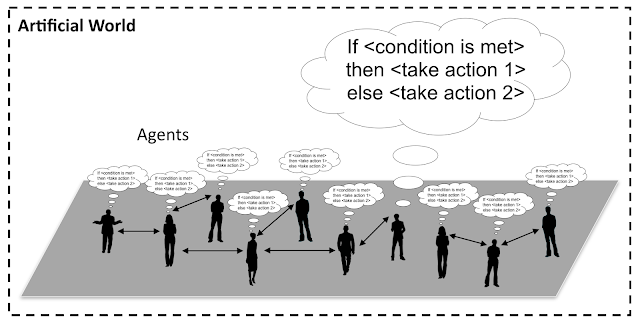 By linking agent-based modeling, social network analysis, and geographic information systems we were able to develop a cognitive framework for the agents, better represent human behavior by modeling the interactions that occur over both physical and social space, and capture the nonlinear, reinforcing nature of the emergence and dissolution of riots. Keywords: agent-based modeling; geographic information systems; social network analysis; riots; social influence; rumor propagation. An agent-based model integrates geographic information systems and social network analysis to model the emergence of riots. The physical environment and agent attributes are developed using empirical data, including GIS and socioeconomic data. 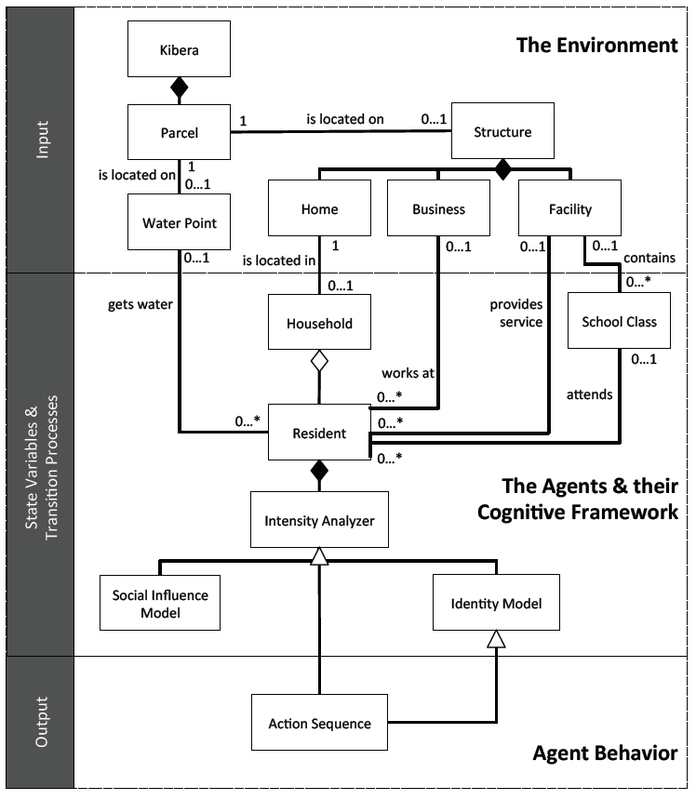 The agent’s cognitive framework allowed for modeling their activities in physical space and interactions in social space. Through the integration of the three techniques, we were able to capture the complex, nonlinear nature of riots. Results show that youth are most vulnerable, and, increasing education and employment has nonlinear affects on rioting. 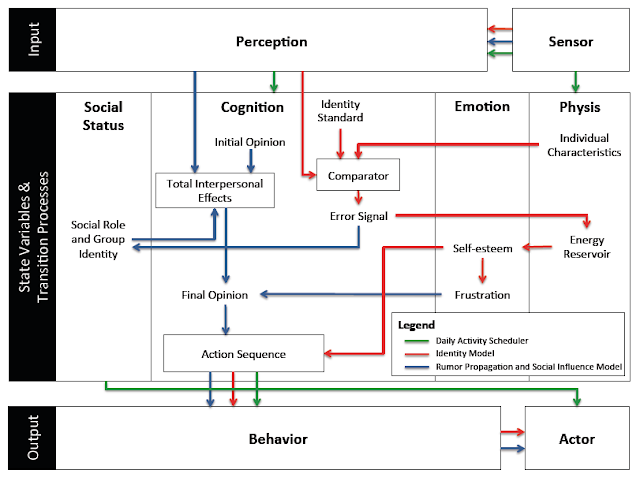 An example of the evolution of social networks of ten Residents across the first two days of a simulation run. The movie below shows the agent-based model which explores ethnic clashes in the Kenyan slum. The environment is made up of households, businesses, and service facilities (such data comes from OpenStreetMap). 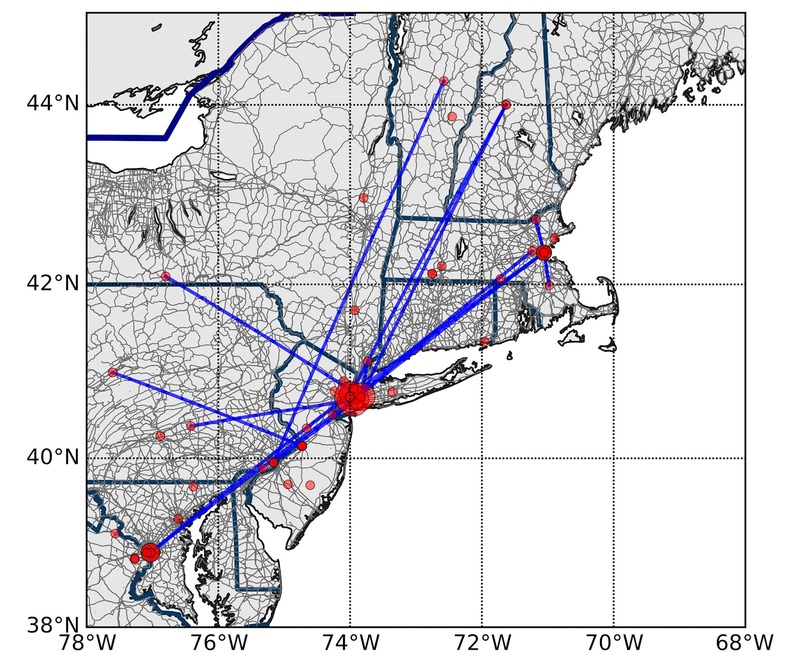 Agents within the model use a transportation network to move across the environment. As agents go about their daily activities, they interact with other agents - building out an evolving social network. Agents seek to meet their identity standard. Failure to reach their identity standard increases the agents frustration which can lead to an aggressive response (i.e. moving from blue to red color) such as rioting. As with many of our models, we provide the data, model code and detailed model description in the form of the ODD protocol for others to use, learn more or to extend. Click here for more information. As normal, any thoughts or comments are most appreciated. Recently Alison Heppenstall and myslef wrote a short introductory chapter entitled "Agent-based Modeling in Geographical Systems" for AccessScience (a online version of McGraw-Hill Encyclopedia of Science and Technology). 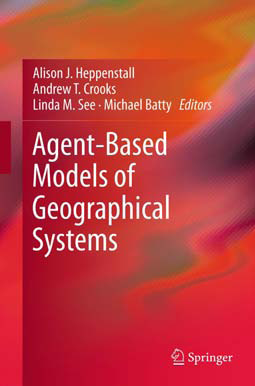 In the chapter we trace the rise in agent-based modeling within geographical systems with a specific emphasis of cities. 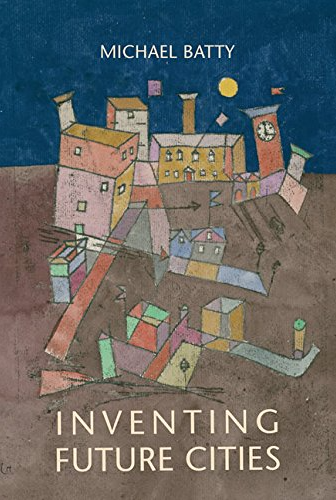 We briefly outline how thinking and modeling cities has changed and how agent-based models align with this thinking along with giving a selection of example applications. 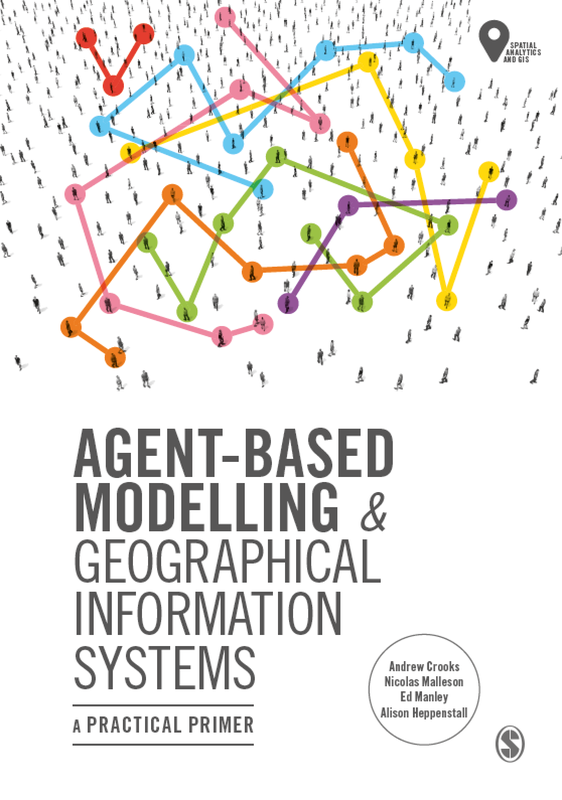 We discuss the current limitations of agent-based models and ways of overcoming them and how such models can and have been used to support real world decision-making. Continuing our work with crowdsourcing and geosocial analysis we recently had a paper published in a special issue of the Built Environment journal entitled "User-Generated Big Data and Urban Morphology." 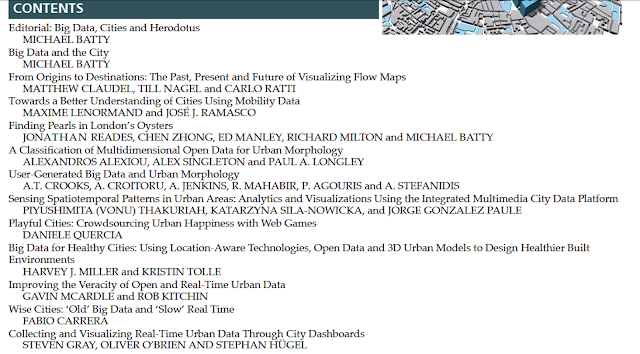 "This cutting edge special issue responds to the latest digital revolution, setting out the state of the art of the new technologies around so-called Big Data, critically examining the hyperbole surrounding smartness and other claims, and relating it to age-old urban challenges. Big data is everywhere, largely generated by automated systems operating in real time that potentially tell us how cities are performing and changing. A product of the smart city, it is providing us with novel data sets that suggest ways in which we might plan better, and design more sustainable environments. 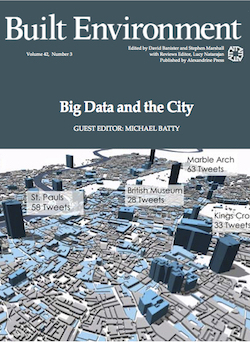 The articles in this issue tell us how scientists and planners are using big data to better understand everything from new forms of mobility in transport systems to new uses of social media. Together, they reveal how visualization is fast becoming an integral part of developing a thorough understanding of our cities." In our paper we discuss and show how crowdsourced data is leading to the emergence of alternate views of urban morphology that better capture the intricate nature of urban environments and their dynamics. Specifically how such data can provide us information pertaining to linked spaces and geosocial neighborhoods. We argue that a geosocial neighborhood is not defined by its administrative boundaries, planning zones, or physical barriers, but rather by its emergence as an organic self-organized social construct that is embedded in geographical spaces that are linked by human activity. Below is the abstract of the paper and some of the figures we have in it which showcase our work. "Traditionally urban morphology has been the study of cities as human habitats through the analysis of their tangible, physical artefacts. Such artefacts are outcomes of complex social and economic forces, and their study is primarily driven by traditional modes of data collection (e.g. based on censuses, physical surveys, and mapping). The emergence of Web 2.0 and through its applications, platforms and mechanisms that foster user-generated contributions to be made, disseminated, and debated in cyberspace, is providing a new lens in the study of urban morphology. In this paper, we showcase ways in which user-generated ‘big data’ can be harvested and analyzed to generate snapshots and impressionistic views of the urban landscape in physical terms. We discuss and support through representative examples the potential of such analysis in revealing how urban spaces are perceived by the general public, establishing links between tangible artefacts and cyber-social elements. These links may be in the form of references to, observations about, or events that enrich and move beyond the traditional physical characteristics of various locations. This leads to the emergence of alternate views of urban morphology that better capture the intricate nature of urban environments and their dynamics." Keywords: Urban Morphology, Social Media, GeoSocial, Cities, Big Data. 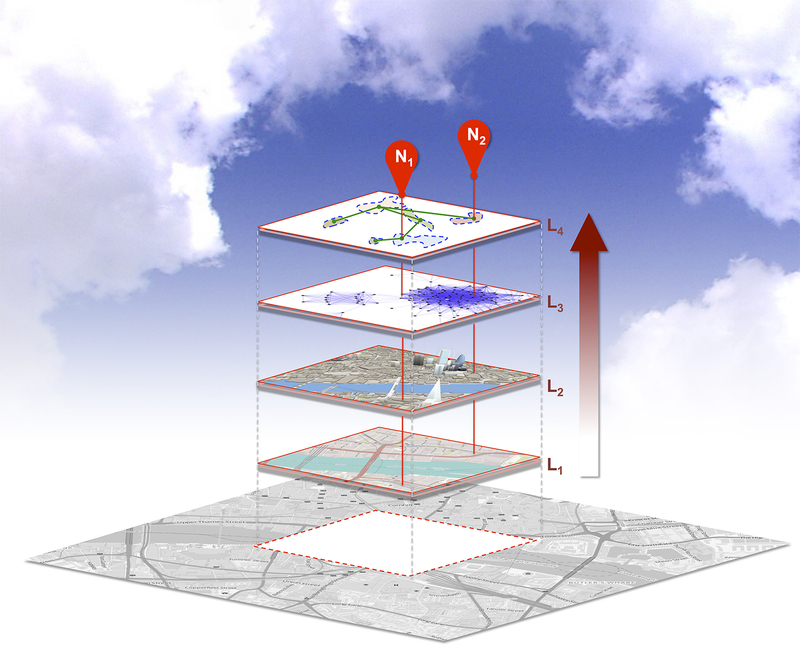 City Infoscapes – Fusing Data from Physical (L1, L2), Social, Perceptual (L3) Spaces to Derive Place Abstractions (L4) for Different Locations (N1, N2). 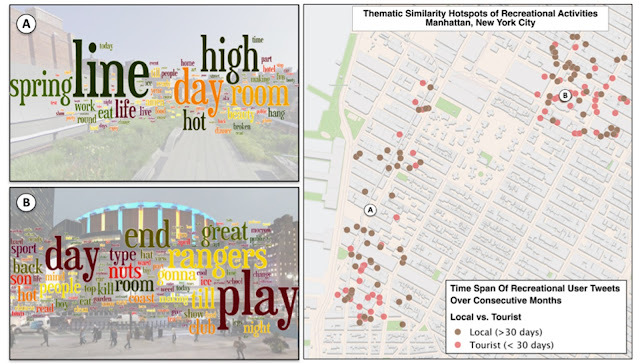 Recreational Hotspots Composed of “Locals” and “Tourists” with Perceived Artifacts Indicating “Use” and “Need”. (A) High Line Park (B) Madison Square Garden. Moving from Spatial Neighborhoods to Geosocial Neighborhoods via Links.